AVRIL Powder Puffs are useful to apply loose or compact powder for an even and good coverage. 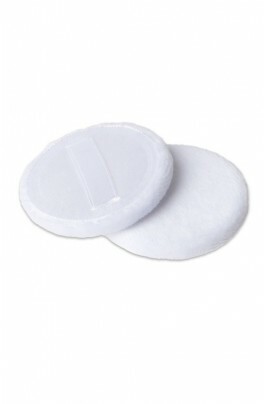 Very soft, they are very nice to use and fix the face makeup. A little string on the back provides good handling. Avril Powder Puff comes handy with its 2.16 inch tiny size. Ideal for touch-ups anywhere anytime ! Assez petites (diamètre 5,5cm). Je ne sais pas si ce sont les houppettes que je n'aime pas, ou si ce sont celles-ci. Je trouve que ça étale mal la poudre, la essuie surtout le fond de teint, et ça assèche un peu la peau. HOW TO APPLY POWDER USING AVRIL POWDER PUFF ? Load some powder on your AVRIL Powder Puff and apply it on your face using gentle pats to fix it, don't rub.